This year, many of my museum-related goals are about ensuring we're giving enough emphasis to empowering people to take positive action for the protection and preservation of our environment. I simply believe that the future health of our local environment is literally "in our hands". We need to listen to our scientists and understand and value the detailed research work they're engaged in every day of the year - and then take positive action ourselves. The Australian Museum (AM) has long been involved in citizen science initiatives - engaging with the public to collect data on animal behaviours or water quality issues. Projects like the Cockatoo Wing Tag project and StreamWatch are great demonstrations of what an army of like-minded volunteers can achieve. These and other projects underpin our AM Centre for Citizen Science which has given a platform for citizen science programs to develop and harness the power of individuals. 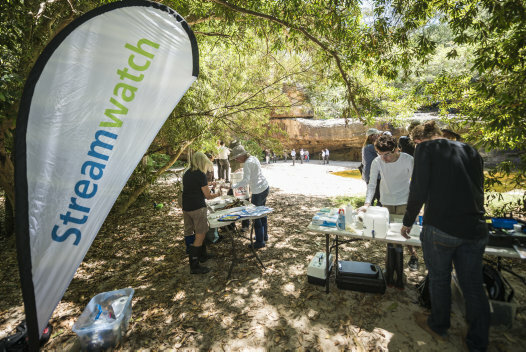 The StreamWatch program currently has over 170 volunteers testing at 160 sites around Sydney, the Blue Mountains and Illawarra. In November 2017 we launched FrogID, a nation-wide five year citizen science initiative to literally count and map the frogs of Australia. Developed in partnership with IBM and funded in part by the Australian Government’s Citizen Science Grants, the project uses state-of-the art smart phone technology to record and identify frog calls (frogs are identified mostly by the calls they make rather than what they look like). Dr Jodi Rowley and friend at the launch of the FrogID app. Why frogs and why now? According to the project lead, Dr Jodi Rowley, a herpetologist from the Australian Museum Research Institute (AMRI), frogs are the "canaries in the coal mine" of climate change impacts around the nation. With over 240 different species of frogs present in Australia, these special creatures tell us so much about the changing environment whether through the impacts of urbanisation or changes in the local climate. Frogs are regarded as one of the most vulnerable groups of animals on the planet so it's timely to find out what's happening to the biodiversity of local populations. Dr Rowley and her team then identify the calls and you're notified which frog you've recorded (the smart phone app has so much great information with photographs of each species, times of year you'll hear calls and other hints to help track and record frogs). Soon we hope this process will be instant (sort of like "Shazam" for frogs) as the technology is further developed. Already more than 10,000 frog calls have been recorded and some of these include species regarded as highly endangered. This is real citizen science in action and a great way for families, schools, walking groups, even cycling groups to do something positive together (yes, let's get those men and women in Lycra involved too). There's also a great education program for classroom groups to participate in the project. The technology is now in the palm of our hands enabling the public to be part of this national campaign. AM scientists will analyse the data collected, count and map the frogs and after a few years we'll have a very good insight into what is happening to the biodiversity of this important group of animals. This just would not be possible without the community's help to record the frogs or the advancements in smart phone technology which IBM has helped us to translate into the app. Kermit was right - it's not easy being green....or purple, brown, yellow, blue or spotted! But now with FrogID, the answer to help protect these vulnerable animals is in our hands. Why not make 2018 the year you become an avid "frogger"? Download the app and start recording frogs - it could become a whole new outdoor past-time for you and your family and friends and who knows, you might even identify a new species of frog. *The Australian Museum has partnered on FrogID with the Queensland Museum, South Australian Museum, Tasmanian Museum and Art Gallery, Western Australian Museum, Museum and Art Gallery of Northern Territory and Museums Victoria. FrogID project is run by the Australian Museum’s Centre for Citizen Science and supported by IBM Australia’s Impact Grants program. The value of resources IBM Australia has contributed to the Australian Museum Frog ID project is more than AUD $360,000.